Rockslides in Norway occur frequently. When they occur above a fjord, the results can be potentially catastrophic. In 1934, over forty people died as a rockslide 700 metres above the fjord created a tsunami that washed over the villages of Fjørå and Tafjord in Møre og Romsdal. 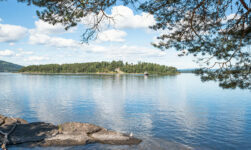 The hundreds of mountain lakes in Norway are also at risk. Lovatnet in Sogn og Fjordane was the location for two disasters: 60 people died in 1905, and 31 years later, another 74 lost their lives. So what with the giveaway title and this intro, you've probably worked out what Bølgen is all about. But the movie isn't just based on historical disaster or potential risk, it's based on a very real risk. Åkerneset is a mountain that is pulling itself apart and all experts agree that it's not a matter of if there is a rockslide, but when. 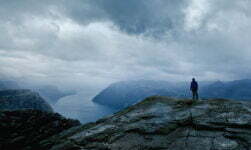 The mountain towers over the Storfjord, a few kilometres north of arguably Norway's most famous fjord: Geirangerfjord. At the end of the fjord is the tourist haven of Geiranger. Geologist Kristian (Kristoffer Joner) is leaving his beloved fjord for the money of the oil industry (I know, we won't dwell on that!) in the “big city” of Stavanger. Just as he packs his bags, the mountain monitoring station picks up some unusual groundwater readings. As this is a disaster movie, no-one shares his concerns. Within hours, a major rockslide smashes into the fjord and the stopwatch is set: Geiranger will be washed away in ten minutes. Bølgen contains shadows of pretty much every disaster movie I've ever watched, none more so than the “why won't anyone listen to me” moments of Dante's Peak. But Dante's Peak was and is a guilty pleasure of mine, so that's no bad thing! Without giving away too much, I do feel the need to warn you of two especially gruesome moments and a harrowing decision for Kristian's wife Idun (Ane Dahl Torp) as the post-wave race for survival intensifies. The latter is an unexpected moment of drama that leaves you considering the lengths you would go to to survive. First things first, Bølgen was better than I'd expected. It's been announced today as Norway's Oscar nomination. It won't come anywhere near a red carpet, but I do expect some international coverage (the version I saw was subtitled in English) and maybe even a cult following. The problem is, other than the very real basis for the film, it adds very little to the disaster movie genre. Disaster movie by numbers, if you will. The budget was super small, and it shows. The money was very clearly spent on the special effects as the water comes surging down the fjord. It looks decent and dare I say it, realistic, but it's to the detriment of the rest of the film. The opening scenes in particular feel rushed and many of the minor characters are disappointing. Despite this, I did enjoy Bølgen. It's a decent effort from the Norwegian film industry, but perhaps it's an opportunity missed? 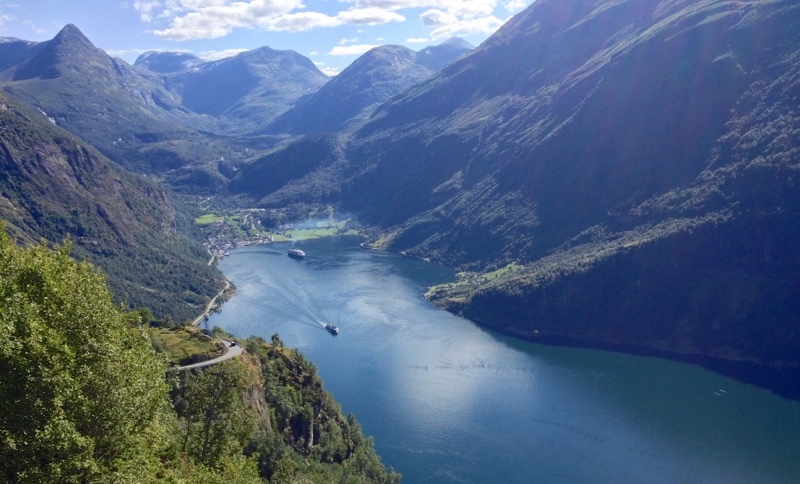 I have been to lovely Geiranger. This will happen one day and the whole area will be changed forever. I hope the sensors will give plenty of warning and people will evacuate. Fortunately it will not happen as suddenly as it does in the film. God bless Norway. Actually, it could happen as fast or even faster. Google Vajont Dam. I watched Bolgen/The Wave shortly after seeing a documentary about the 1963 landslide on Monte Toc that caused an inland tsunami that killed approximately 2,000 people and washed away entire villages, and I was stunned at the similarities. Very scary! This movie was great, you critics just love to nitpick on movies. Most of your comments are very unessary negative tone. 6 million or so dollars the effects are way better than some big budget hollywood movies. Critics are people. Their opinions mean NOTHING. It was a good movie. And more importantly, it opens eyes as to what one day WILL happen again. I live on the coast of Georgia (USA), and just went through Hurricane Matthew. Water CAN and WILL kill. I agree gentlemen. It was a very good movie. He didn’t criticize the effects…he specifically stated you can tell that is where the money went. The problem is that the rest of the movie suffers for it. It’s ok, but it’s by no means Oscar worthy. It follows every disaster movie trope there is. Protagonist finds something wrong but no one wants to listen to the protagonist. Protagonist keeps checking in and pushes forward anyway. Protagonist is the ONLY ONE with the information that shines the light on the impending disaster, but it’s not enough time before the one who doubted him is killed by said disaster. Protagonist saves the day for those in cars and gets people running (come on now…if you were stuck in a car and saw everyone run past you, do you REALLY need the hero to explain that you, too, have to run??). Protagonist searches for rest of family. Protagonist and family ALL survive. We’ve seen this played out multiple times. This time, it took place in Norway. No one is doubting that water can and will kill. But that doesn’t make the movie outstanding. I enjoyed the movie. I enjoy all disaster movies…it’s one of my favorite types of films. But you need to look at this movie objectively. It’s quite ok to enjoy a movie while being able to recognize the flaws it most definitely has. This is a rather good movie. Far less melodramatic than a Hollywood movie would have been. And based on a real threat. This is very well made movie. I like the people that translated this into English. I like their voices and very well spoken. I enjoyed the movie. It was touching and I learned something I didn’t previously know. I hope they find an answer before tragedy strikes. Great movie. Nice to see something that isn’t from Hollywood. I agree the special effects were good enough. The main characters were great. Felt a little like Donte’s peak. I thought the same thing. That is North Sea water I’m assuming, and so one would think it would be very cold water all year round…somewhat like Lake Superior here in the US. And it didn’t seem to bother them at all. Maybe they’re just tough Norwegians (my husband’s mother was 100%!). As an American of Norwegian descent I’ve only been to Norvege once. If it wasn’t for the cost of living I’d retire there. I thought this was better than the usual Hollywood disaster movie, the main characters were believable and I didn’t miss all the Excessive CGI. I will say I agree with the comment concerning the likelihood of hypothermia, having been in fjord water I think it stays cold in the summer. I had no idea tsunamis could happen in Norway. So shocking to me. I watched it on Netflix. I watched The Wave tonight and really enjoyed it. Beautiful scenery and believable action. Just enough to make me close my eyes until realizing I need to use my eyes or just give up on reading the subtitles. I live in U.S. and English is my first and only language. I never watched a movie with subtitles until my children were grown and my husband was gone. Saying that I wonder how many good subtitled movies were missed over the years. Funny how a woman doesn’t own a remote when she is married. Even if the woman purchased the television. Getting back to the movie, I know the water would probably be terribly cold and in a real tsunami hypothermia would quickly set in and kill people. The action was good enough that the lack of killing more people was worth letting some of the actors live.. (-: Thanks to the writers, directors, and actors a Norwegian movie was in my living room and kept my night less lonely. I also enjoyed the movie. I have not seen a dubbed film in many years, so I was hesitant at first, but it’s done well and the voices are a good match, so it doesn’t take away from the movie. They seemed to arrange the dialogue in each scene in such a way that there were very few close-ups where you could obviously see that the lips didn’t match the words. Not a bad little film! 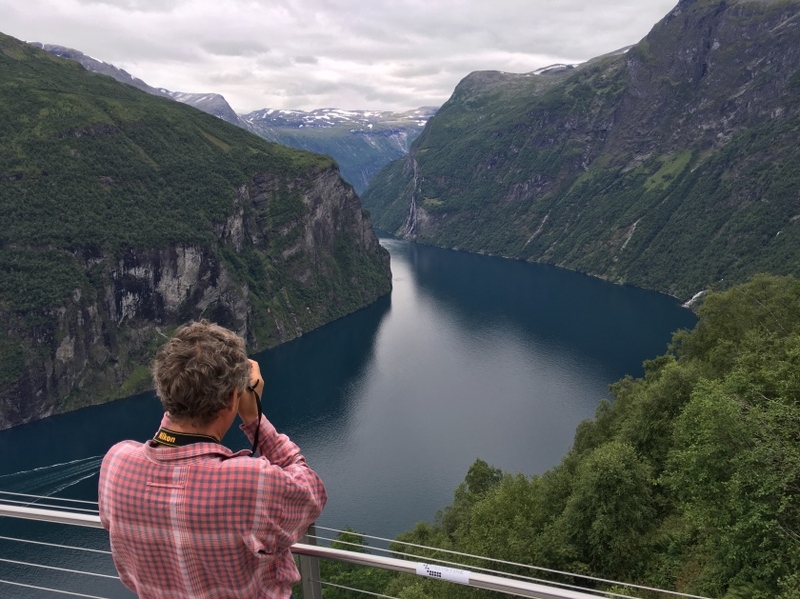 I traveled the fjords in a cruise and, it was spectacular, in Geiranger we took a tour to the top and the views were spectacular. 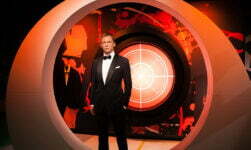 I enjoyed the movie very much and, also learn about the tsunamis. This is how you make a disaster movie. Enjoyed very much and it’s worth a re-watch. I just watched this movie and was so blown away by it. I think the critics are very wrong, the actors were great, the scenery was awesome and the effects were so realistic. It was a nice change of pace from the over effects done in Hollywood these days! We’re in LA and so are saturated with big-budget movies. This film was a refreshing break from all that over-done nonsense. We thought the low budget of the film actually worked in its favor, forcing the script to rely more on suspense rather than lots of special effects. We actually hid our eyes a couple of times too til we had to get back to the subtitles. Speaking of, we always find that watching a foreign film in the original language with subtitles instead dubbed is much more authentic and catches the mood more accurately. Plus having spent time in Sweden and Norway I love hearing the language again. Definitely a fun suspenseful disaster movie with all the requisite plot twists and turns, complete with a happy and sappy ending. Just our cup of tea. I thought this was a beautiful movie. A real family’s story of survival and not just another ‘San Andreas’ or “Dante’s Peak”? It had a realness most disaster movies don’t even come close to. For low budget this is a huge accomplishment. It looks stunning with beautiful cinematography and compelling performances. 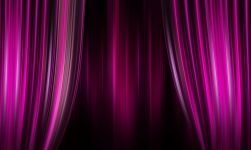 I am in the entertainment business and am a film buff from NYC and lived in Los Angeles as well and have friends who work in film. This film is in a class all by itself and has 4 user review stars on Netflix so it must be striking a chord with people. I don’t get this travel blogger’s critique but ok we all are entitled but this film is not to be missed. 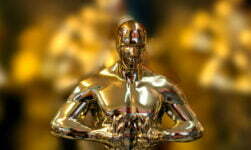 what does “oscar worthy” mean? in my opinion the last few oscars have been awarded to movies MUCH worse than this one… an academy award used to mean something, now it’s just …well…not what it used to be. This movie was incredible, and I didn’t mind watching with English subtitles at all. The acting and story line was emotional and relatable. Even with a language barrier, you were able to connect with the characters, including the minor ones. The disaster of the film wasn’t over exaggerated as in other movies: San Andreas, Poseidon, Day After Tomorrow, 2012, to list a few. Instead, the disaster feels realistic, convincing, and frightening. I’d recommend to anyone who enjoys a good disaster movie. Talfjord (the town on the other end of the wave) has only 4 minutes warning. It was a low budget film but the intensity of all that occurred made it worth all the other parts! The bravery of the main characters make it so edge of your seat type that you do not want to miss a single part! I give this 2 thumbs up for creativity and bravery of those whom sacrificed their lives to save others! Wonderful movie My husband and I fully enjoyed it! !